Summer is still going strong here in BC, so still lots of time to get out onto your patio and enjoy some refreshing white wines. Here are some white wines, plus a bonus wine, that I received from TIME Estate Winery, in the Okanagan. 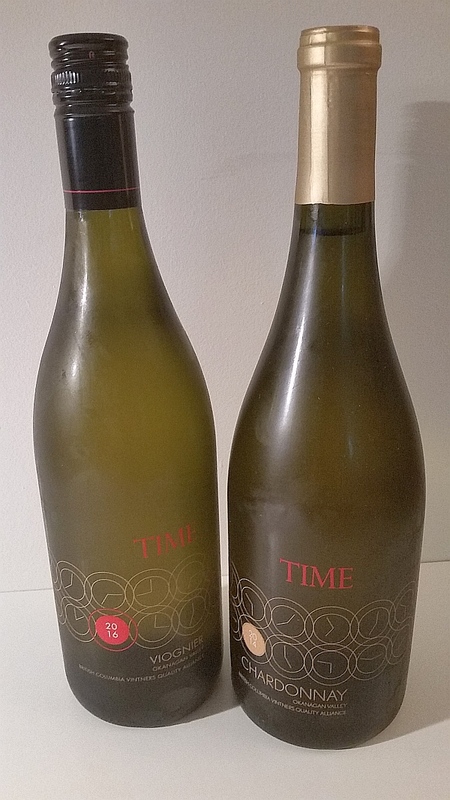 TIME Estate Winery Chardonnay 2014 ($25) – A deeper golden lemon in colour, which I’m guessing in part comes from new oak barrel aging. Fuller intensity, very nice nose, with aromas of ripe pears, pineapple, butterscotch and vanilla. Dry, round and silky with a fuller mouth feel. Soft acidity to this wine. Lots of pears and pineapple, with a light oak treatment. The wine has a buttery, viscous feel to it which I like. Medium plus length, finishing with some pepperiness along with more pineapple. Very good quality wine. Try with a curried chicken salad or crab cakes. Rating: Intense pears, pineapple, and butterscotch on the nose. Bigger, silky, thicker mouth feel, with a continuation of the pear and pineapple fruitiness on the palate. Yum. TIME Estate Winery Viognier 2016 ($22.99) – Medium straw with a green tint to this wine. Quite strong toasty nose, followed by lesser amounts of tropical fruit and green fruit. The toasty oak stays quite prominent with decanting. The wine is dry, but quite round, and with full mouth feel. Medium acidic prickle on the tongue. Pronounced toasty oak on the palate with lesser amounts of pear, pineapple, and stone fruits respectively. With decanting the toasted oak flavour decreases a bit and the tropical fruit flavour increases a bit. I also picked up some minerality with decanting. The wine has a medium plus length, finishing with bitter citrus rind, toasty oak, then vanilla and pepper. The oak is a bit too pronounced for me at the moment. Maybe 2-3 years of aging will help mellow it out? Rating: Very pronounced oak on the nose and palate with tropical fruits on the nose and palate. 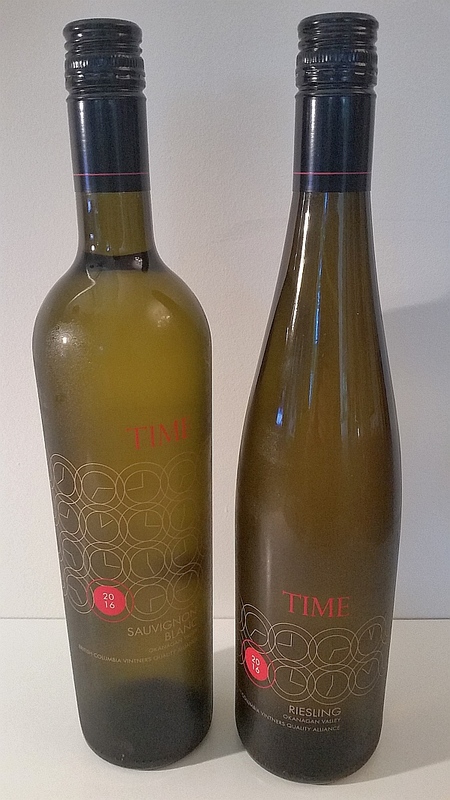 TIME Estate Winery Riesling 2016 ($22.99) – Medium straw in colour. A lighter, restrained nose, with aromas of peach, and a whiff of petrol. With decanting you also pick up citrus and lees. The wine has 9.5% alc which makes you think this wine will be quite sweet, but you would be wrong. On the palate it is slightly off-dry, but it has very high acidity, similar to a Tantalus Riesling. Medium plus body and pronounced flavour intensity of tart fruits, bright citrus and a mix of peach and apples. There is also a trace of petrol, honey, and minerality on the palate. With decanting the flavour intensity drops a bit, but it is still quite strong. A long puckering finish, with tart citrus and stone fruit, and salty minerality. A wine that will age well (try 3-4 years) due to the high acidity and become more interesting in the future. Rating: A wine that is built for aging thanks to it’s very high acidity. Nice stone fruit and citrus aromas and flavours. TIME Estate Winery Sauvignon Blanc 2016 ($22.99) – Pale lemon green in the glass. Lots of stone fruits, peaches in particular, and white flower petals on the palate, with grapefruit in the background, and toasted oak. This wine is dry with medium plus acidity and flavour intensity. Medium bodied. The wine has more citrus than stone fruit on the palate, along with some apple toward the finish. There is a light oak treatment that adds some structure to this wine. With decanting the wine feel rounder, smoother, and heavier in your mouth. With decanting you also get pineapple, pears and nutmeg flavours in the glass. I think giving this wine some decanting definitely makes it much more enjoyable. I tried this wine out on friends after decanting and it was unanimously liked. Rating: – This with with it’s oaked, Fume Blanc, style, definitely opens up with air and is quite enjoyable. Citrus and stone fruit flavours with oak in support on the palate. While the title of my article denoted new white wine releases from TIME Estate Winery, they also had a bottle of Syrah Rosé wine for me to try, as a Rosé wine typically is fermented and released in a similar time frame to white wines. TIME Estate Winery Syrah Rosé 2016 ($22.99) – Lighter rose petal pink; clear and bright in the glass. Medium intensity, sweetish nose, with aromas of candied red fruit, candied strawberries, rhubarb, a and hints of floral and bramble. Dry, quite, round with medium plus acidity. Flavours of tart red candied cherries and candied strawberries. Some floral component along with rhubarb on the palate. medium plus length, getting peppery toward the finish. The candied fruit on the nose and palate, along with the rhubarb is quite prominent in this wine. Rating: A rosé with with lots of candied red fruit and strawberries, along with rhubarb on the nose and palate.